“On The Town” Written By Michael Hardy, Houstonia – On The Town, 27 January 2015. “Public Art Markets Business” Written by Jaryn Jones, Texas Tech Today, 18 October 2013. Houston – Home and Fashion Issue, “Pop & Circumstance”, September 2010. Artfully Abiline, “Celebrating 30 Years of Outdoor Sculpture, September 2010. Gloss Magazine, “Scene This Summer”, August 2010. 002 Houston, “When Words Leave Off, Music Begins”, May 2009. 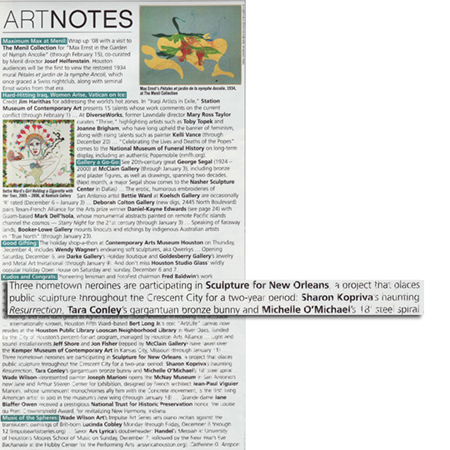 “Contemporary Art Energizes New Orleans” by Tria Wood, ArtsHouston, January 2009. “On the Make” Houston Modern Luxury, December 2008. Paper City, “Art Notes”, December 2008. “Art Notes” by Catherine D. Anspon, PaperCity, December 2008. 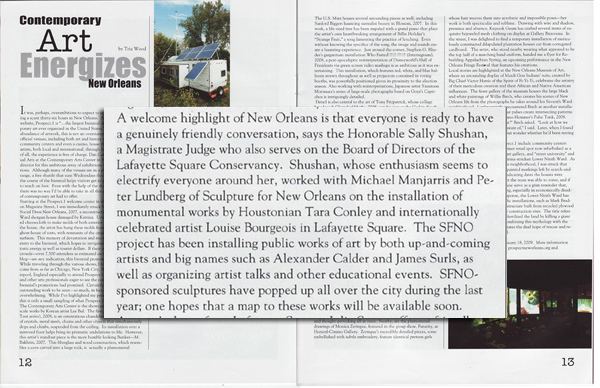 “Houston artist’s sculpture hops over to New Orleans” by Douglas Britt, Houston Chronicle Arts In Houston blog, 18 November 2008. 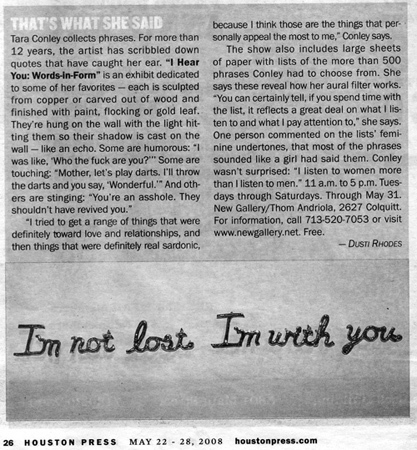 “That’s What She Said” by Dusti Rhodes, Houston Press, May 2008. “Cornerstone,” by D. Eric Bookhardt, February 2008. “Your Go-To Guide to Houston’s Sizzling Galleries,” by Catherine Anspon. Featured Artist, ArtsHouston Website, February 2008. “Tara Conley,” ArtsHouston Podcast, February 2008. “Jenny Bunny,” ArtsHouston Blog, February 2008. “Creating Working Communities: Houston’s Artist Studio Spaces,” ArtsHouston, December 2007. “Revitalizing a Holiday Icon: Buffalo Bayou Art Park’s 2006 Xmas Tree Show,” ArtsHouston, December 2006. “‘Up’ to the Task,” Houston Press, October 2006. “Editor’s Picks,” ArtsHouston, September 2006. “Editor’s Picks,” ArtsHouston, September 2006. This Houston-based artist has an extraordinary knack for creating organic, yet original, shapes from man-made materials, adding her own delightful sense of humor and wonder to the mix. 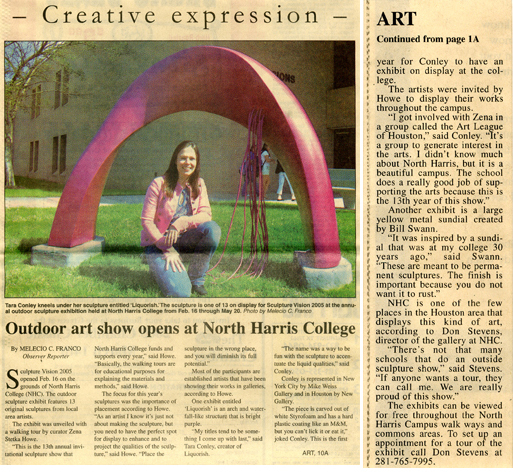 “Outdoor Art,” The Observer, March 2006. Sculpture Vision 2006 Exhibition Catalog by Zena Sttka-Howe. “Creative Expression ,” The Observer, February 2005. Sculpture Vision 2005 Exhibition Catalog by Donald Stevenson. 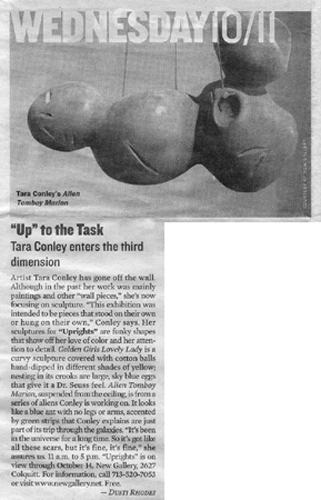 “Artist Profile: Tara Conley” by Thomas Kurzy, 2004. “Gallery Row, New Gallery/Thom Andriola.” Intown Magazine, October 2004. “Turning Point for a Dealer.” The Berkshire Eagle. By Charles Bonenti, August 2003. “Artswatch.” The Austin American Statesman. By Michael Barnes, July 2002. 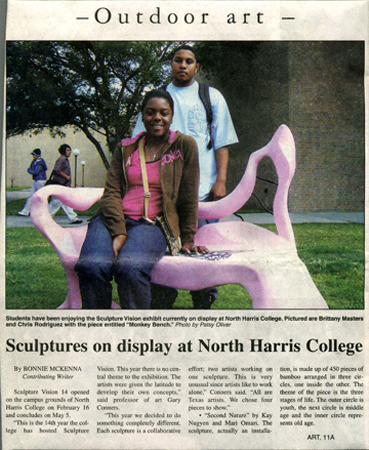 “Houston Artist to Join ISEP Team.” CACHH Newsletter, January 2002. “What’s the Alternative?” Paper City. By Catherine D. Anspon, November 2001. Steel Grrrls Exhibition Catalog: Art League of Houston and The Jonson Gallery, University of New Mexico, Albuquerque. By Victoria Lightman and Kathleen Whitney, September 2001.